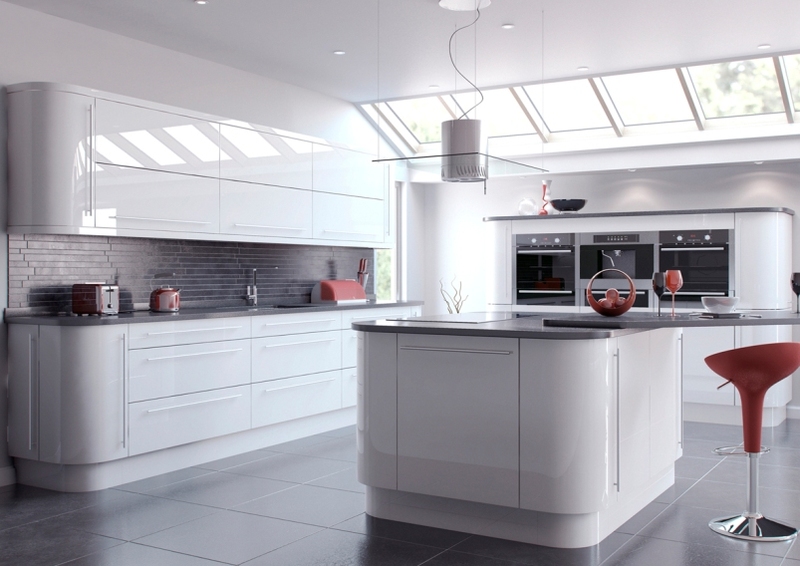 To ensure you’re getting the best value when buying a gloss kitchen, it’s important to take into account the quality of the door on offer. 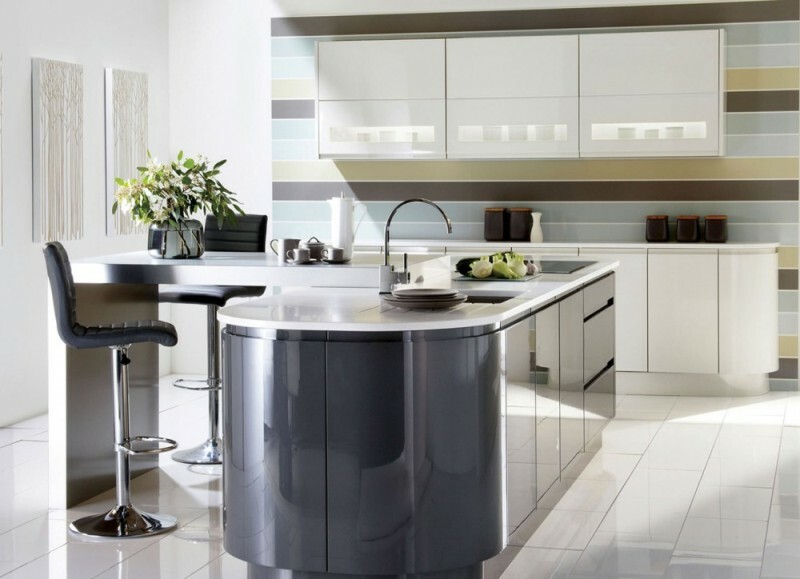 Just like cars, gloss kitchens vary enormously in terms of quality & how long they’ll last. 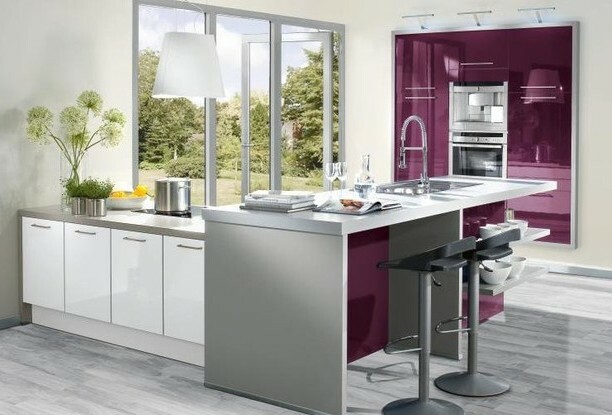 The purpose of this blog is to help you understand the key differences between the main types of gloss kitchens available so you can make a more informed decision when buying your kitchen. 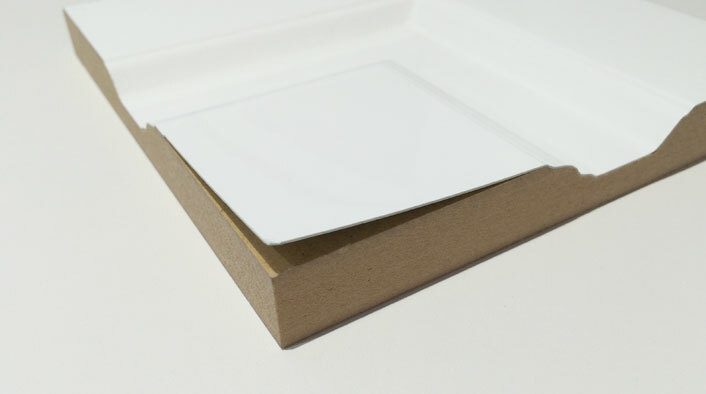 A thin layer of plastic (vinyl/PVC) or paper mixed with resin (foil) or PET (Polyethylene terephthalate) wrapped around an MDF base. 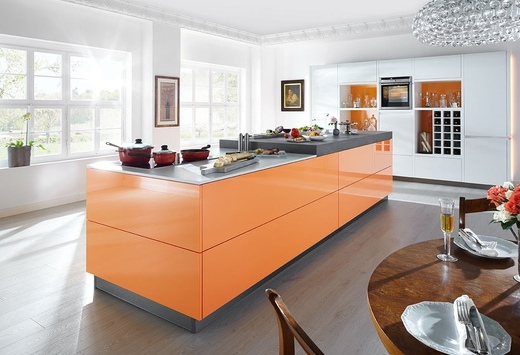 These are the lowest quality gloss kitchen doors available on the market & are characterised by an unreflective, bobbly, orange peel like finish. This type of door is mainly sold by places like Howdens, Benchmarx, Wickes & Wren. Not only do these type of gloss doors have a poor quality finish, they’re also susceptible to de-laminating. De-laminating is where the surface of the door peels away from the base (pictured below). De-laminating usually starts with bubbling along the edges of the doors. Is it possible to buy good quality foil wrapped, PVC wrapped, vinyl wrapped or PET wrapped kitchen doors? Yes, It’s still possible to buy good quality foil wrapped, PVC wrapped, vinyl wrapped or PET wrapped gloss doors from local showrooms. The reason for this is that the foil, PVC or vinyl used on the doors sold in local showrooms tend to be much thicker than those sold in the chains and trade suppliers. Despite being a very inexpensive foil wrapped kitchen, the finish on the specialist showroom kitchen below is still reasonable quality. 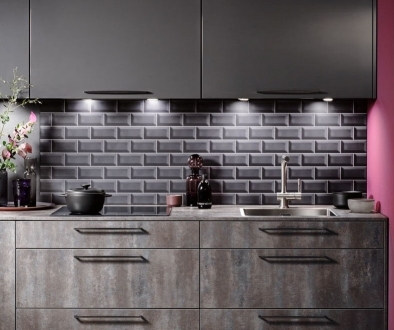 It’s also worth noting that the risk of a high quality wrapped type gloss kitchen door de-laminating is much lower than it is with a low quality foil, PVC or vinyl. However, although the risk of de-laminating is low, there’s still a risk. Therefore, our recommendation would be to try & steer clear of foil wrapped, PET wrapped, PVC wrapped and vinyl wrapped gloss doors. 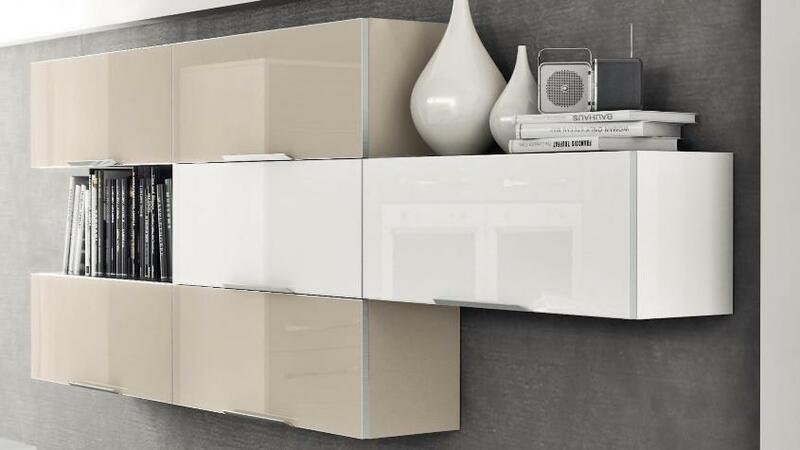 Hi Gloss Acrylic kitchen doors are very high quality & come in 2 forms: Either solid acrylic, eg. Parapan, or acrylic faced (a thin layer of acrylic, bonded onto an MDF base). With a perfectly smooth, highly reflective, mirror like finish, gloss acrylic doors imitate glass for a fraction of the cost. The other benefit of gloss acrylic doors is they’re very hard wearing. 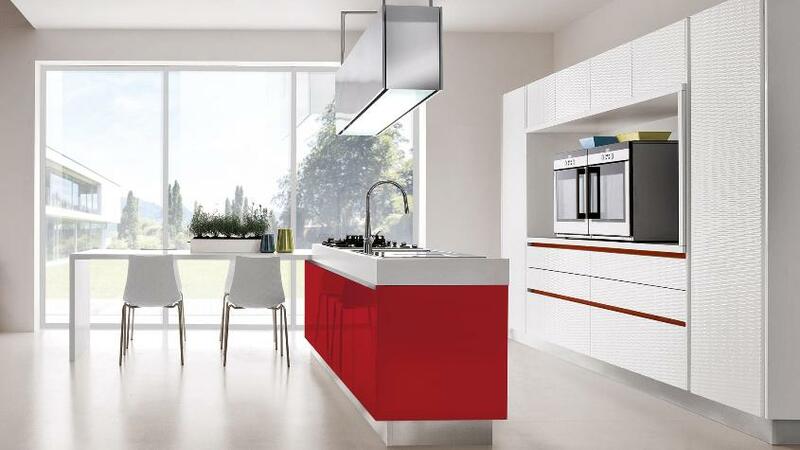 Therefore, if you think the kitchen is going to take a lot of wear & tear, acrylic is probably your best option. 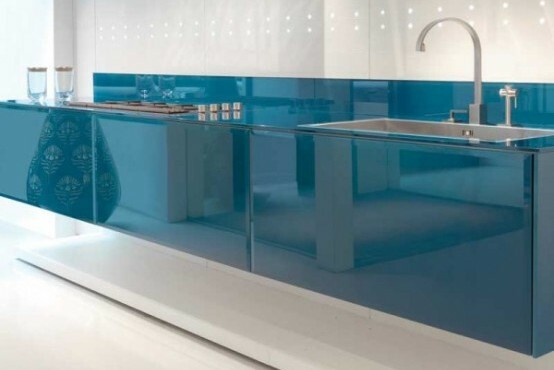 Hi Gloss Acrylic kitchens do however have many disadvantages. Firstly, if you look closely enough, you can see where the door has been edged on all 4 sides. 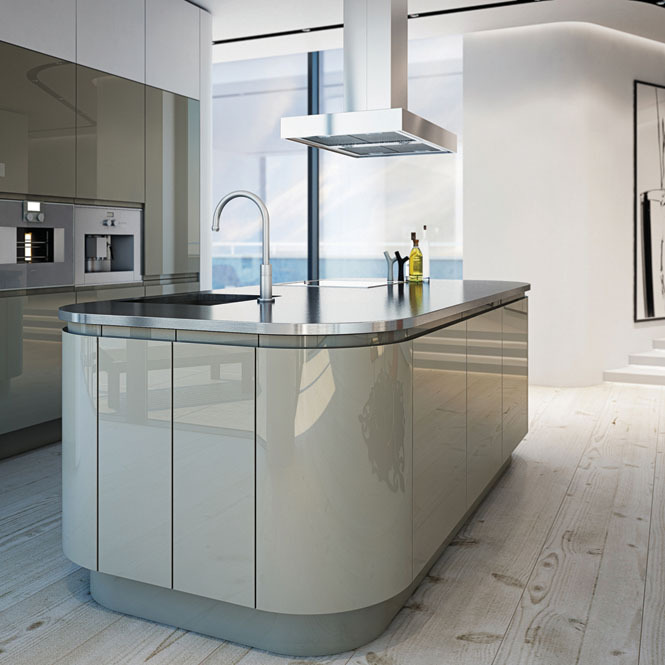 The other disadvantage of Acrylic gloss kitchens is they cost around 20% more than painted and lacquered gloss kitchens & are arguably no better in terms of their finish. also, if you scratch an acrylic gloss door, it can’t be repaired like a lacquered gloss door can. 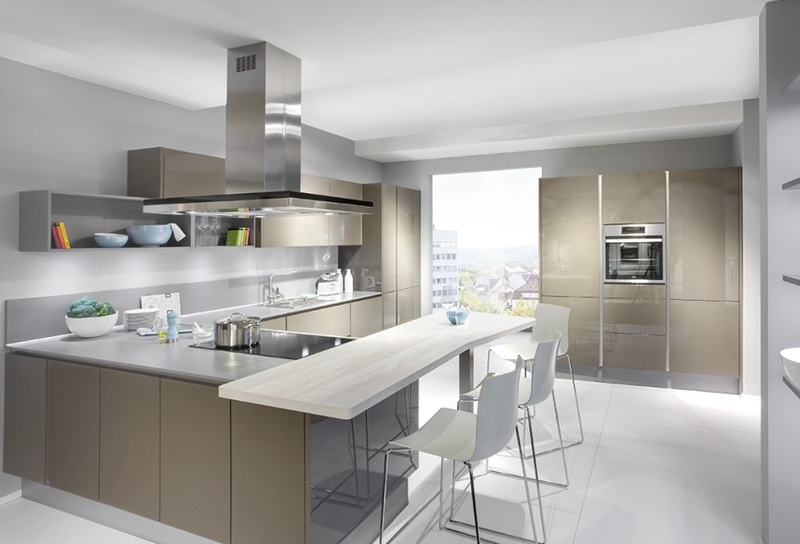 Finally, the reason why most German kitchen brands don’t offer acrylic doors is because of the risk of colour match problems. Unfortunately, it’s not uncommon for an acrylic gloss kitchen to be delivered & for customers to find shading differences between the doors, even though they are all supposed to be the same colour. Also, if you do need to replace an acrylic door several years down the line, it’s most likely that the new door will be a different shade to the existing doors. 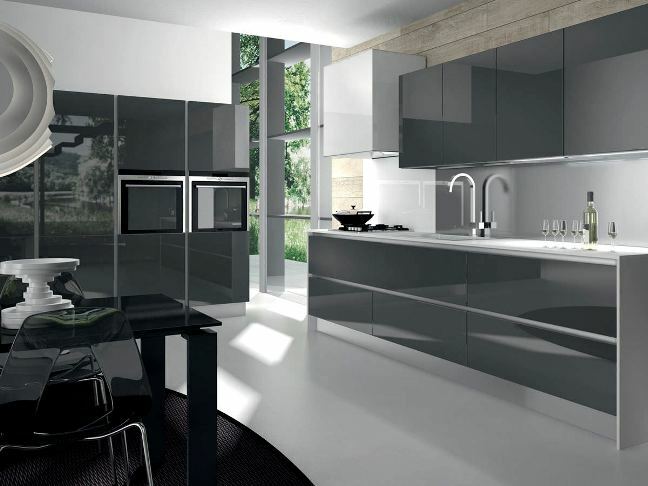 The kitchens shown below are all Hi Gloss Acrylic. Where’s the best place to buy gloss acrylic kitchens from? Unfortunately you’re unlikely to find a wide selection of gloss acrylic doors in places like Howdens, Wickes, Magnet & Wren. 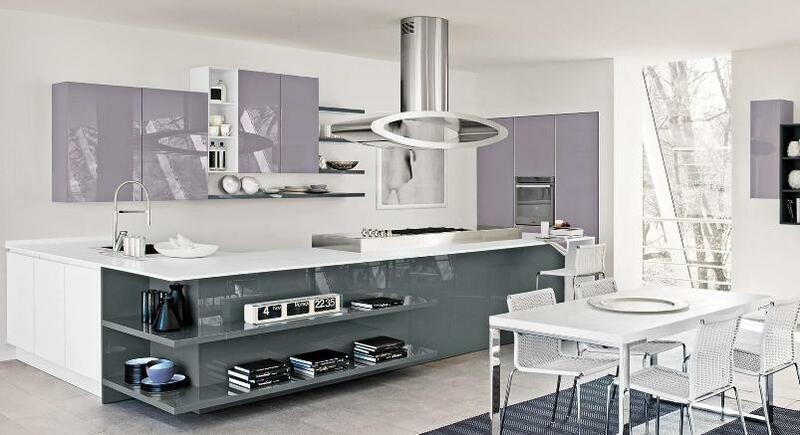 The best places to buy acrylic gloss kitchens from are local kitchen showrooms. 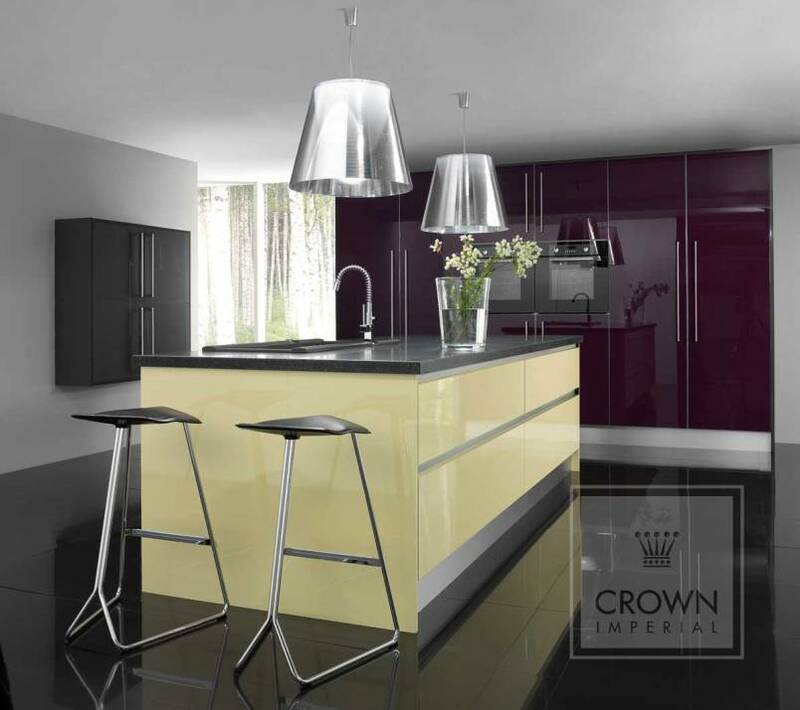 In fact, if you know the right showrooms to visit, it’s possible to buy an acrylic gloss kitchen for similar to what you’ll pay for a low quality wrapped type gloss kitchen from somewhere like Howdens, Wickes, Magnet or Wren. The problem is, knowing which are the right showrooms to got to. This can be like finding a needle in a haystack. This is where we can help – We’ll put you in touch with the right showrooms to visit. Several coats of high quality lacquer/paint applied to an MDF base. 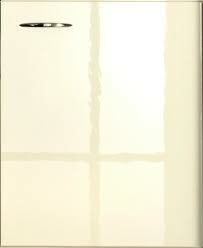 Just like acrylic doors, painted & lacquered gloss doors have a perfectly smooth, highly reflective, mirror like finish. This type of door is very high quality & again, is favored by the quality German & British kitchen brands found in local kitchen showrooms. 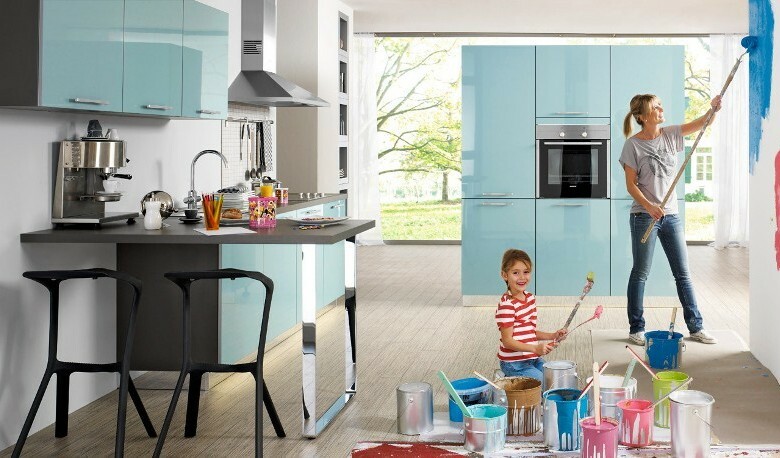 The big advantage painted & lacquered gloss kitchens have over acrylic is they usually cost around 20% less than acrylic. The other advantage of a painted & lacquered gloss door is you’ll never see any visible edges like you can with an acrylic door. This is because they’re lacquered on the front & all 4 edges. The final advantage painted & lacquered gloss doors have over acrylic gloss door is they can be repaired if you scratch them. If an acrylic gloss door gets scratched you can’t repair it. However, scratches on painted or lacquered gloss doors can be professionally repaired using colour matched lacquer & T-Cut. Painted & lacquered gloss doors do have one disadvantage though & that’s durability. Unfortunately, there’s always the risk a painted & lacquered gloss door could chip under heavy usage. However, as mentioned above, a chip on a lacquered door can always be professionally repaired. The gloss kitchens below are all painted & lacquered. 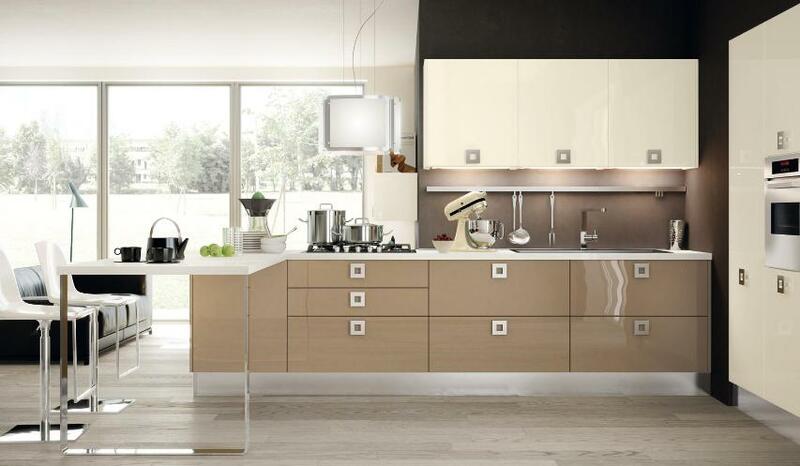 Where’s the best place to buy painted and lacquered gloss kitchens from? 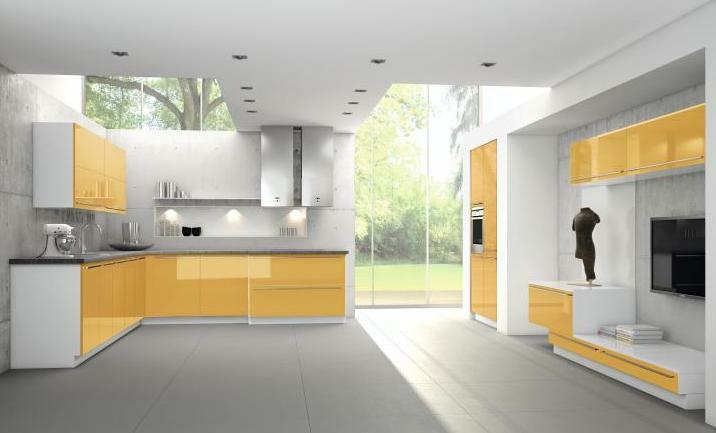 Unfortunately, you’re unlikely to find a wide selection of painted & lacquered gloss kitchens in places like Howdens, Wickes, Mgnet or Wren. 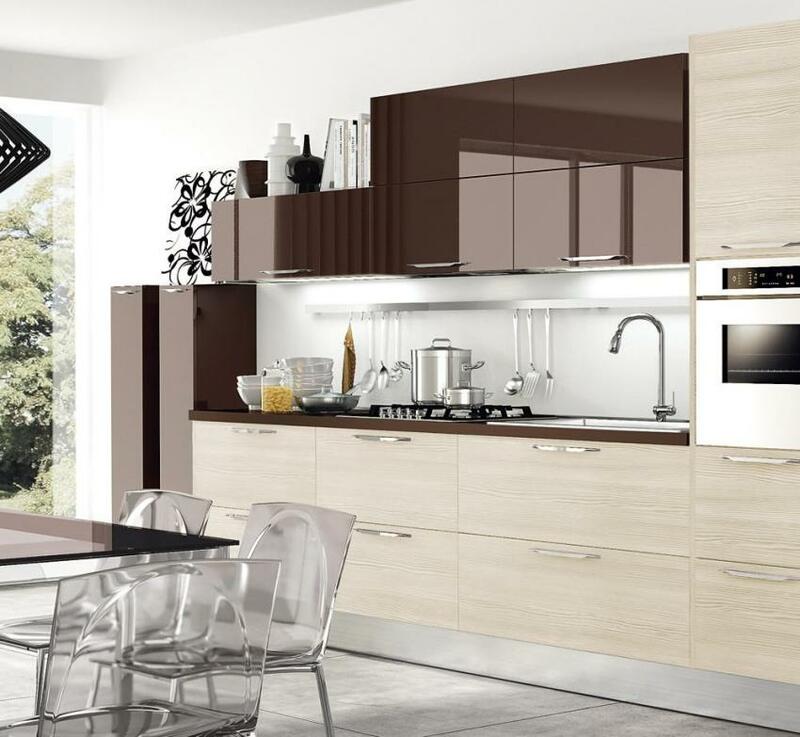 The best places to buy painted & lacquered gloss kitchens from are local kitchen showrooms. In fact, if you know the right showrooms to visit, it’s possible to buy a painted & lacquered gloss kitchen for similar to what you’ll pay for a low quality foil wrapped, PVC wrapped, PET wrapped or vinyl wrapped gloss kitchen from somewhere like Howdens, Benchmarx, Magnet or Wren. The problem is knowing which are the right showrooms to visit. This can be like finding a needle in a haystack. This is where we can help – We’ll put you in touch with the right showrooms to visit. 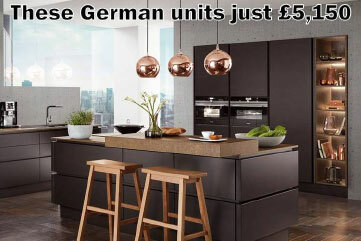 In fact, if you know the right showrooms to visit, it’s possible to buy a German painted & lacquered gloss kitchen for a similar price to places like Howdens, Wickes, Magnet & Wren, or just a fraction more. 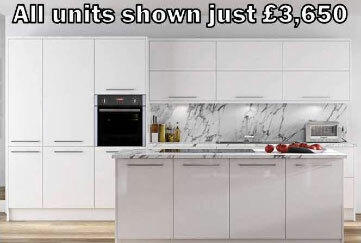 Plus, some showrooms will also throw in up to £2,500 worth of free worktops & appliances when you buy the units. 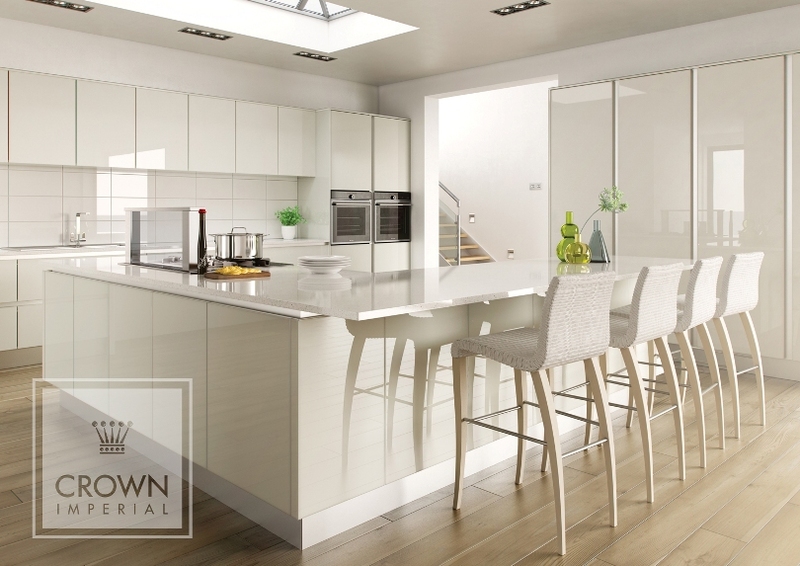 Available only from local showrooms, the highest quality gloss doors available are made from glass. 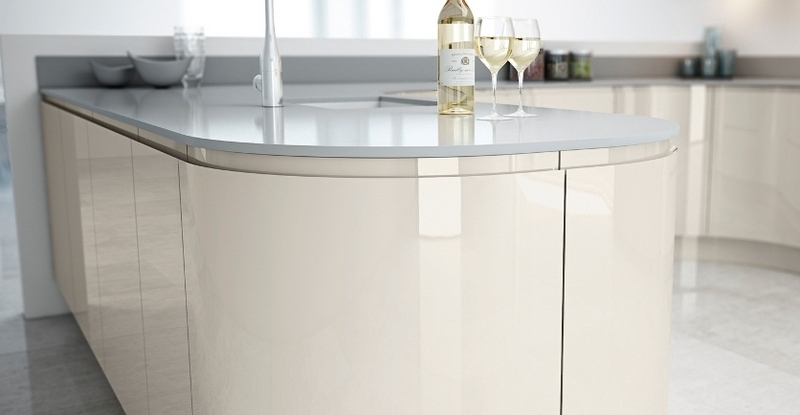 Toughened glass, back painted, is bonded to either a chipboard or MDF base. The finish on a glass door is flawless. However, the ultimate finish comes at a price. 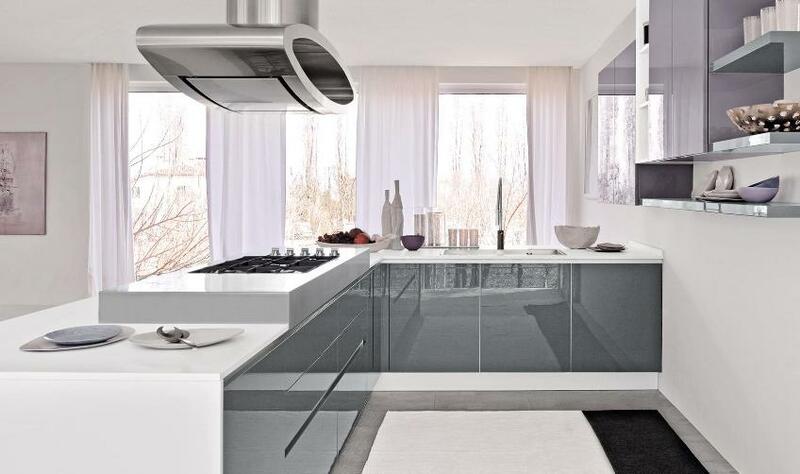 Expect to pay 2 or 3 times more for a glass kitchen than any other type of gloss kitchen. 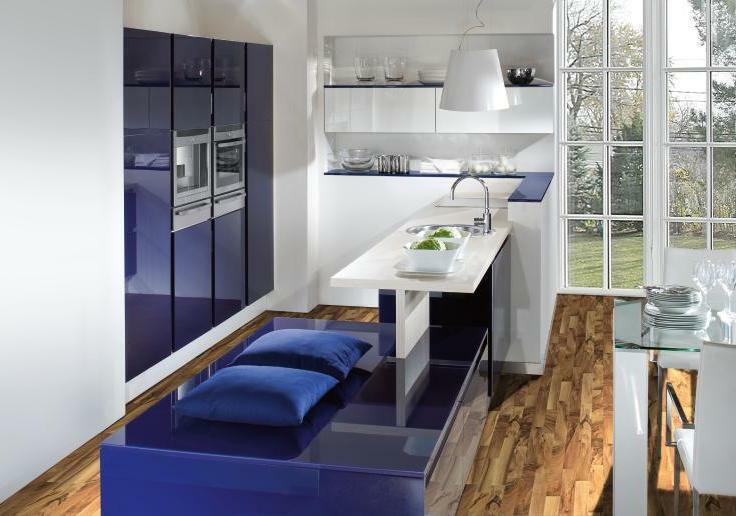 The 2 gloss kitchens below are both glass. 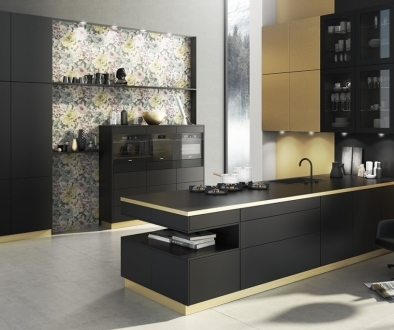 We’ll recommend local showrooms whose luxury kitchens come without the luxury price tag.